The Falkland Islands are a place distant from most people, but magical in their wildness and wildlife. It is not easy to drive to wild beaches (Figure 1), but drivers for hire abound and they ARE NECESSARY to drive across the open country. It takes about 2.5 hours to get from Stanley to Volunteer Beach. 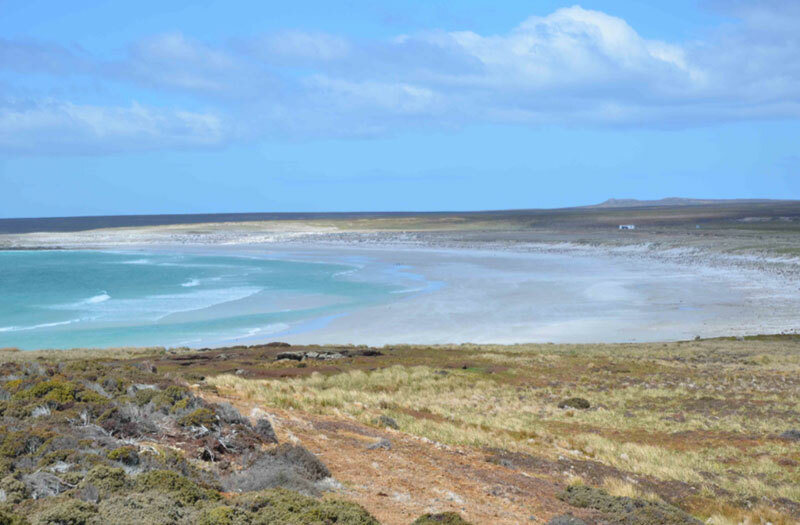 Volunteer Beach is one of the nearest big beaches to the only town in the Falklands, Stanley. The beaches near Stanley are lovely and can be seen from a distance, but they were mined by the Argentines in the 1982 war and remain surrounded by barbed wire. Penguins may not set off the mines, but a person can! In the first view one gets of Volunteer Beach (Figure 2), it looks like many other barriers around the world. It has a white sand beach that is backed by a low flat area and a lagoon. The water is a beautiful shade of blue that reminds one of the tropics. A small bathroom is located in the center of the flat ridge behind the beach. A closer inspection (Figure 3) shows that the beach begins with a cobble patch with a blue-green sand dune plant colonizing the beach. No large dune exists landward of the beach however. The wind in the area is fierce, but there is no proper sand dune at all. 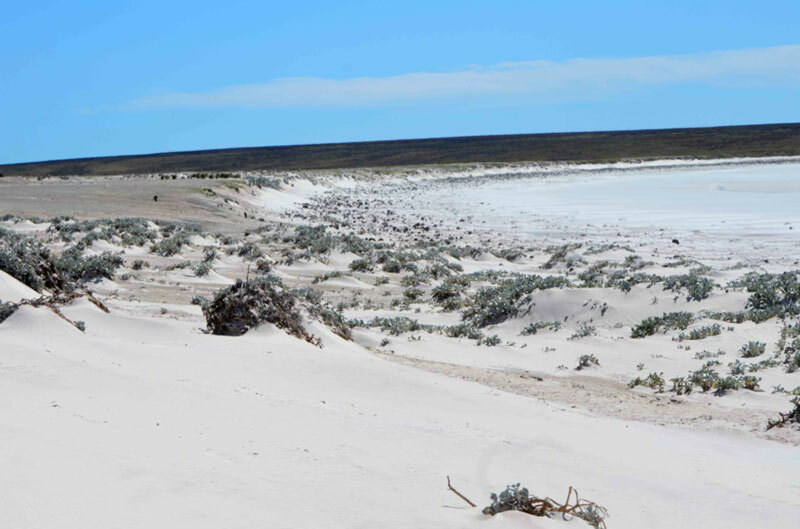 The flat area behind the beach (Figure 3) is a sheep-grazed, penguin-burrowed area that is eroding more than accumulating sand. The beach proper is made of almost pure quartz sand. This “sugar sand” beach is very rare. One might think of someplace as near to Antarctica as a formerly glaciated landscape, but not this part of the Falklands. The landscape is ancient and the rocks have been weathered down to almost pure quartz with few other minerals remaining. 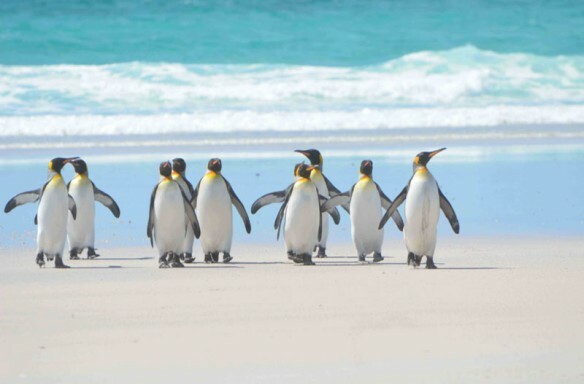 The main attractions to Falkland beaches in November, when I visited, are the penguins (Figure 4). King Penguins, standing more than a meter high, are everywhere and not very shy. Visitors are asked to keep 6 m from them, but they often walk towards people. They stand and face the sea for long periods of time, and then suddenly rush forward and swim into the surf using their wings like paddles. 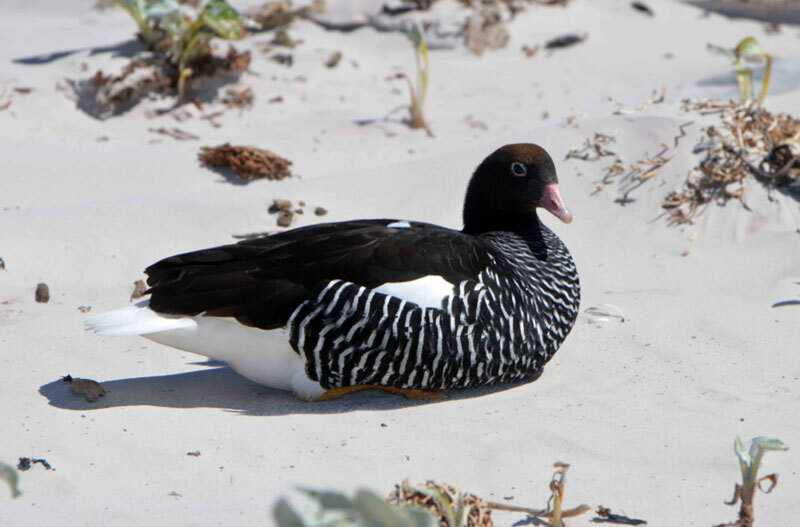 Among the small sand accumulations trapped by kelp in the back of the beach are several kinds of nesting birds (Kelp Goose, figure 5). It is best not to approach too closely when they are nesting or they might walk away from their chicks, a cold prospect for the small birds. 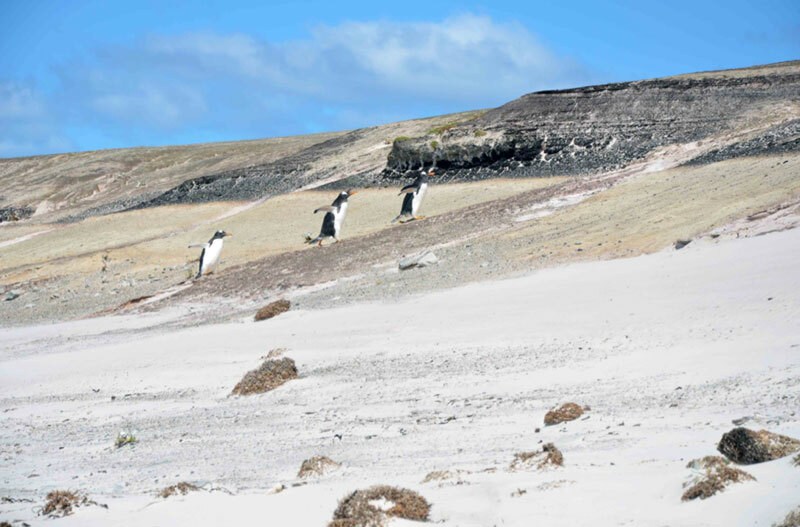 Penguins do not nest on the beach, and they “run” up the bluff bank after fishing to return to their colony. Gentoo Penguins (Figure 6) are a lot more fearful of people than King Penguins and move quickly across the beach. 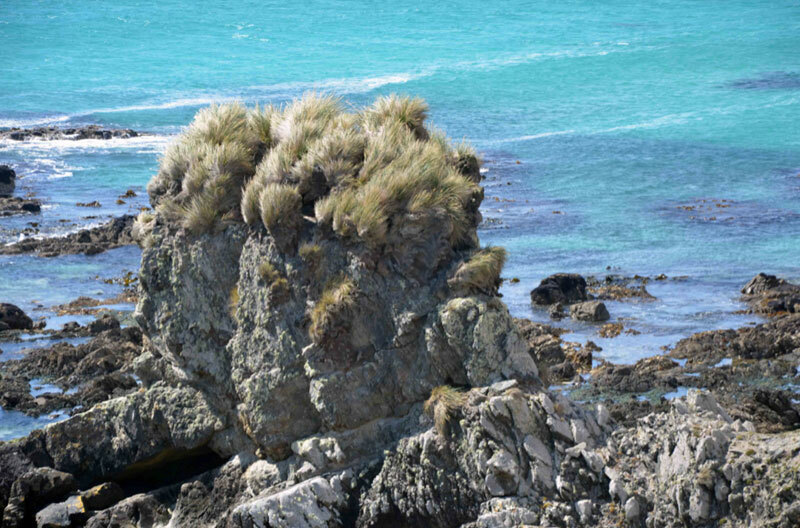 Some penguins have eggs and chicks in burrows on top of the ridge behind the beach. This landform is a peat deposit that the birds easily dig into (Figure 7). 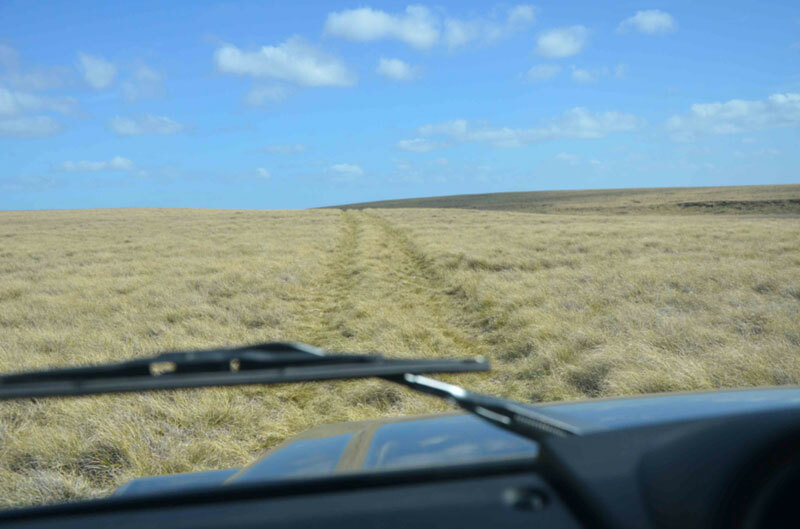 The Tussoc Grass that formed the peat was destroyed long ago by burning and sheep and no other native grasses replace it. 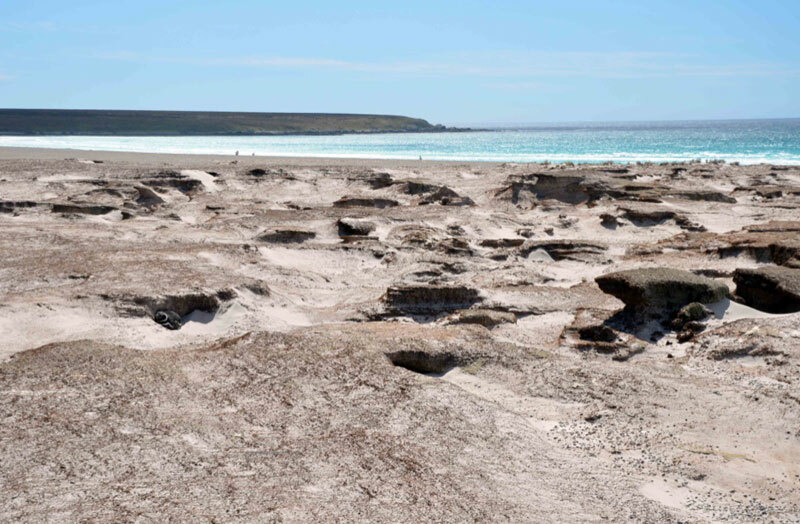 The backside of the peat deposit contains several large colonies of nesting penguins (Figure 8). These are somewhat roped off, but it is not difficult to photograph the King, Gentoo and Magellanic Penguins back here. One has to wonder at the impact of the penguins on the coastal landscape, as well as the profound impact of the sheep who walk among them. 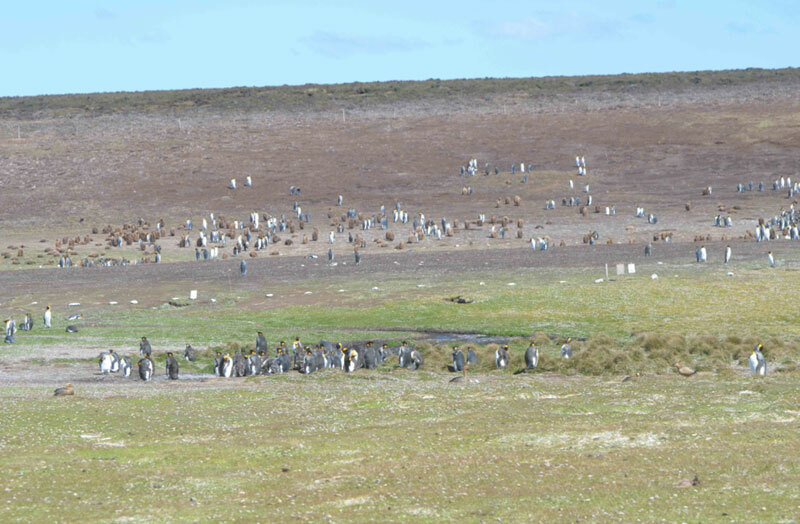 Prior to European colonization, the Falklands were uninhabited and Tussoc Grass grew all around the perimeter of the island. Now Tussoc Grass is seen only on inaccessible ledges (Figure 9). This grass, that formed the peat behind Volunteer Beach, grows to 3-4 m in height and would make the landscape very different in appearance if it were re-established.